The Sullivans (DD-637) was laid down as Putnam on 10 October 1942 at San Francisco Calif. by the Bethlehem Steel Co.; renamed The Sullivans on 6 February 1943; launched on 4 April 1943; sponsored by Mrs. Thomas F. Sullivan the mother of the five Sullivan brothers and commissioned on 30 September 1943 Comdr. Kenneth M. Gentry in command. Following shakedown The Sullivans got underway with Dortch (DD-670) and Gatling (DD-671) on 23 December and arrived at Pearl Harbor five days later. During training operations in Hawaiian waters the ship was assigned to Destroyer Squadron (DesRon) 62. On 16 January 1944 she steamed out of Pearl Harbor with Task Group (TG) 58.2 bound for the Marshall Islands. En route to Kwajalein Atoll the group was joined by Battleship Division (BatDiv) 9. Two days later as the American warships neared their target picket destroyers were sent ahead to protect the main force from the enemy. On 24 January TG 58.2 arrived at the dawn launching point for air strikes against Roi For two days The Sullivans screened Essex (CV-9) Intrepid (CV11) and Cabot (CVL 22) as they launched nearly continuous aerial raids. Thereafter the destroyer continued her operations to the north and northwest of Roi and Namur Islands in the Kwajalein group until 4 February when TG 58.2 retired to Majuro to refuel and replenish. Underway at high noon on the 12th The Sullivans screened the sortie of TG 58.2 outward bound for Truk. The same carriers whose planes had blasted Roi and Namur steamed in the van Essex Intrepid and Cabot now headed for the Japanese fortress base in the Central Pacific. From the time the group arrived at its launching point on 16 February the carriers launched what seemed to be nearly continuous air strikes against Truk. "No enemy opposition of any kind was encountered " wrote The Sullivans' commander "indicating that the initial attacks came as a complete surprise." While the enemy may have been slow to react at the outset they soon struck back torpedoing Intrepid at 0010 on the 17th. The carrier slowed to 20 knots and lost steering control. The Sullivans Owen (DD-536) and Stembel (DD-644) stood by the stricken carrier and escorted her to Majuro for repairs. Reaching Majuro on 21 February the destroyer soon sailed on to Hawaii arriving at Pearl Harbor on 4 March for drydocking and upkeep. Underway again on the 22d The Sullivans covered the sortie of TG's 58.2 58.9 and 50.15 from Majuro bound for the Palaus Yap and Woleai Islands. On the evening of the 29th while the American warships were approaching the target area enemy aircraft attacked them but were driven off by the antiaircraft fire from the ships. The next day The Sullivans screened the carriers during air strikes and that evening helped to beat off a Japanese air attack. After returning to Majuro for replenishment the warship screened TG 58.2 during air strikes on Hollandia Tanahmerah Wakde and Aitape to support amphibious operations on New Guinea. Late in April The Sullivans participated in support of air strikes on the Japanese base at Truk. On the 29th during one of these raids the Japanese retaliated with a low-level air attack. American radar picked up four Japanese planes 16 miles away coming in fast at altitudes varying from 10 to 500 feet. When the planes came within range The Sullivans opened up with one 40-millimeter twin mount and all five 5-inch guns. Two aircraft splashed into the sea due to the firing of the American ships and one crossing ahead of The Sullivans was taken under fire and crashed in flames off her port beam. The Sullivans arrived off the northwest coast of Ponape on the afternoon of 1 May and provided cover for the battleships led by lowa (BB-61) which bombarded the island. From the disengaged side of the screen The Sullivans fired 18 rounds from extreme range at Tumu Point. She then noted three beached Japanese landing barges and shifted her fire to them. However she received the general cease-fire order shortly thereafter. During the task unit's retirement The sullivans refueled from Yorktown (CV-10) and arrived at Majuro on 4 May. Ten days later TG 58.2 sortied again bound for Marcus and Wake Islands. Launching the first raid at 0800 on the 19th the American carriers kept up nearly continuous air strikes with no enemy interruptions for three days. En route back to Majuro The Sullivans and her sister destroyers conducted a thorough but unsuccessful search for a suspected submarine. On 6 June The Sullivans got underway again bound for Saipan Tinian and Guam to screen carriers in conducting air strikes. On occasion while in the screen The Sullivans' radar picked up enemy "snoopers" around the periphery of the formation and before dawn at 0315 on the 12th TG 58.2 shot down one in flames. On the 19th Japanese aircraft attacked the task group. The Sullivans picked up a plane visually at a range of less than five miles. "Judies " diving from 23 000 feet pressed home their attacks. One taken under fire by The Sullivans took tracer fire from the ship's 20- and 40-millimeter batteries and moments later crashed just short of the horizon. American air attacks against Pagan Island made without enemy retaliation topped off the Saipan-Tinian-Guam strikes; and The Sullivans proceeded with TG 58.2 to Eniwetok for upkeep. Underway on 30 June The Sullivans resumed work in the screen of carriers launching air strikes to support operations against Saipan and Tinian. During this action The Sullivans served as fighter direction ship for TU 58.2.4. On Independence Day The Sullivans joined Bombardment Unit One ( TU 58.2.4) to conduct a shore bombardment of airfields shore batteries and other installations on the west coast of Iwo Jima. The heavy ships in the group opened fire at 1500 and smoke and dust soon obscured targets along the western shore of the island making spotting difficult. The Sullivans second ship in a column of destroyers opened fire at 1648 on planes parked on the southern airstrip. After three ranging salvos the ship commenced hitting twin-engined "Bettys" parked in revetments along the strip. Five planes blew up and eight other planes were probably damaged by shrapnel and burning gasoline. Minutes later an enemy ship resembling an LST came under The Sullivans gunfire and caught fire astern. While Miller (DD-535) closed to complete the destruction of the enemy vessel The Sullivans and the remainder of the bombardment unit retired and rejoined TG 58.2. From 7 to 22 July TG 58.2 operated south and west of the Marianas conducting daily air strikes on Guam and Rota Islands before returning to Garapan Anchorage Saipan to allow the carriers to replenish bombs. Underway at dawn on the 23d The Sullivans accompanied the task group as it sped towards the Palaus for air strikes on the 26th and 27th. She joined TG 58.4 for temporary duty on 30 July and continued air strikes until the 6th of August when she joined TG 58.7 the heavy bombardment group and operated with TF 34 until 11 August when the group returned to Eniwetok for replenishment. Early in September as the Navy prepared to take the Palaus The Sullivans supported neutralizing air strikes against Japanese air bases in the Philippines. At dawn on the 7th she began radar picket duty for TG 58.2 and continued the task through the strikes of the 9th and 10th. From 1800 on 12 September the ships noted an increase in air activity observing many bogies which merely orbited the formations as snoopers. The carriers conducted further raids on the central Philippines on the 13th and 14th and then shifted course to the north to subject Manila to air attacks commencing on the 21st. Three days later American planes again hit the central Philippines. Returning to Garapan Harbor Saipan at dawn on the 28th The Sullivans went alongside Massachusetts (BB-59) for ammunition provisions and routine upkeep. However the cross-swells in the anchorage swept The Sullivans hard against the battleship's steel hide damaging the destroyer's hull and superstructure. Following brief antisubmarine patrol duty she proceeded to Ulithi on 1 October. While undergoing tender repairs alongside Dixie The Sullivans formed part of a nest of destroyers.blown away from the tender during a heavy storm which lashed the anchorage. The Sullivans drifted free downwind and got up steam "in a hurry." However she collided with Uhlmann (DD-687). Many small boats were being tossed about and The Sullivans rescued four men from Stockham's gig before it disappeared beneath the waves. As the storm abated on the 4th the warship returned to Ulithi to complete the abbreviated tender overhaul alongside Dixie. At 1615 on 6 October The Sullivans sortied with the carriers and protected them during raids against targets on Formosa and the Ryukyus. On the evening of the 12th as the planes returned to the carriers radar spotted the first of many Japanese aircraft coming down from the north. For the next six hours approximately 50 to 60 Japanese aircraft subjected the American task force to continuous air attacks. Nearly 45 minutes after sunset The Sullivans sighted a "Betty " coming in low on the starboard side and took it under fire. During the next 15 minutes the formation to which The Sullivans was attached shot down three planes between 1856 and 1954 the destroyer herself took five planes under fire. Varying speed between 18 and 29 knots the formation undertook eight emergency maneuvers. Again and again timely turns and the great volume of gunfire thrown up by the ships repulsed the enemy air attacks. The second phase of the attack began at 2105 on the 12th and continued through 0235 on the 13th. The Japanese increased the use of "window" to jam American radar transmissions while their flares lit up the evening with ghostly light. The formation made smoke whenever enemy flare-dropping planes approached creating an eerie haze effect which helped baffle the enemy pilots. Meanwhile The Sullivans and the other ships in formation executed 38 simultaneous turn movements at speeds between 22 and 25 knots as their guns kept up a steady fire to repel the attackers. The next day the carriers again launched successful strikes on Formosa. During the ensuing night retirement the formation again came under attack by Japanese torpedo carrying "Betties" which struck home this time and damaged Canberra (CA-70). The Sullivans then helped to protect the damaged cruiser. On the 14th "Betty" torpedo bombers scored against Houston (CL-81).The Sullivans soon joined the screen which guarded the two battle-battered cruisers as they retired toward Ulithi. Things progressed well until the 16th when the Japanese mounted a heavy air attack to attempt to finish off the "cripples." Houston reeled under the impact of a second hit astern and The Sullivans opened fire on the "Frances" which had made the attack and splashed the Japanese plane. The Sullivans and Stephen Potter (DD-538) then took a second "Frances" under fire and knocked it down off the bow of Santa Fe (CL-60). The Sullivans rescued 118 Houston men and kept them on board until the 18th when she transferred them to Boston (CA-69). While the damaged cruisers were making their way to Ulithi a Japanese surface force attempted to close the formation before TF 58 intervened to drive them back. The Sullivans transferred salvage gear to Houston and helped with the ship's many wounded. For his part in directing the destroyer's rescue and salvage attempts Comdr. Richard J. Baum received his first Silver Star. On 20 October The Sullivans joined TG 38.2 for scheduled air strikes on the central Philippines in support of the Leyte landings. At dawn of the 24th reconnaissance located a Japanese surface force south of Mindoro and the American carriers launched air strikes all day against the enemy warships. That morning a Japanese air attack developed and The Sullivans downed an "Oscar" fighter plane. By 25 October enemy forces were sighted coming down from the north TF 34 including The Sullivans was formed and headed north following the carrier groups in TF 58. At dawn on the 26th the carriers launched air strikes to harass the Japanese surface units now some 60 miles north. At 1100 TF 34 reversed course topped-off the destroyers with fuel and formed fast striking group TG 54.5 with lowa (BB61) New Jersey (BB-62) three light cruisers The Sullivans and seven other destroyers. The American force missed the Japanese by three hours but ran across a straggler and reported sinking an Atago-class cruiser. Japanese records fail to confirm the claim. After sweeping south along the coast of Samar hunting for enemy "cripples " The Sullivans and other units of TG 34.5 reported back to TG 38.2. The destroyer then remained in the Philippine area screening the fast carriers and standing by on plane guard duties through mid-November. At dusk on the 19th during one of the many air attacks fought off by The Sullivans the destroyer damaged a "Betty" by gunfire and watched it disappear over the horizon smoking but stubbornly remaining airborne. Six days later she had better luck when her guns set a Japanese plane afire and splashed it into the sea. Two days later her task group returned to Ulithi. The destroyer undertook training exercises from 8 to 11 December before rejoining TG 38.2 to screen its warships during air strikes on Manila and southern Luzon beginning on 14 December. On the 17th running low on fuel The Sullivans commenced refueling but with the weather worsening minute by minute she broke off the operation. A typhoon swept through the Fleet with the wind clocked at an estimated 115 knots on the morning of 18 December. Three destroyers were sunk and several ships damaged by the winds and waves. The Sullivans aided by the "lucky shamrock" painted on her funnel emerged from the typhoon undamaged and on the 20th commenced searching for men lost overboard from other ships. The lingering bad weather resulted in cancellation of air strikes and The Sullivans retired to Ulithi on Christmas Eve. After a brief run to Manus and back escorting lowa The Sullivans sortied from Ulithi on 30 December to screen TG 38.2's air strikes on Formosa in support of the American landings on Luzon. Heavy seas forced a three-day postponement of a high-speed thrust toward the target originally planned for the night of 6 January 1945. During the evening of the 9th the task force passed through Bashi Channel and entered the South China Sea. Three days later carrier planes from TG 38.2 swept over Saigon and Camranh Bay Indochina hammering at whatever enemy merchantmen they found. Soon after the conclusion of the air strikes a bombardment group TG 34.5 was formed to go after possible "cripples" and dispatch them by surface gunfire. Accordingly two battleships two heavy cruisers three light cruisers and 15 destroyers raced into Camranh Bay but found it devoid of Japanese shipping. Throughout the day however carrier pilots had better luck and enjoyed a veritable "field day" with coastal marus. During subsequent air strikes on Hainan Island Hong Kong and Formosa The Sullivans served on radar picket duty 10 miles ahead of the task group. A brief respite for upkeep at Ulithi in late January preceded the ship's deployment with TG 58.2 covering the carriers as they launched devastating air strikes against the Japanese homeland itself hitting Tokyo and other targets on Honshu on 16 and 17 February. From the 18th through the 21st American carrier-based air power struck at Japanese positions contesting the landings on Iwo Jima. More strikes were scheduled for Tokyo four days later but bad weather forced their cancellation. Retiring from the area TF 68 fueled and commenced a high-speed run at Okinawa at noon on 28 February. Later that day The Sullivans sighted and destroyed a drifting mine. At dawn on 1 March Hellcats Avengers Dauntlesses and Helldivers pounded Japanese positions on.Okinawa. The ships of the task force encountered no enemy opposition from sea or sky and soon retired towards Ulithi. The Sullivans sortied 12 days later bound for Kyushu and southern Honshu to support the invasion of Okinawa. Once again screening for TG 58.2 The Sullivans stood by as the carriers launched air strikes on 14 March. On 20 March The Sullivans fueled from Enterprise (CV-6) at 1152 clearing the carrier's side five minutes later when a kamikaze alert sent the ships scurrying. At 1439 The Sullivans commenced maneuvering to go alongside Enterprise again this time to pick up a part for her FD radar antenna. Soon however another enemy air attack scattered the ships. As a line had not yet been thrown across to the carrier The Sullivans bent on speed and cleared her as other ships in the task group opened fire on the attackers. A Japanese plane plunged through the antiaircraft fire and crashed into Halse1y Powell (DD-686) astern as that destroyer was fueling alongside Hancock (CV-19) . The stricken destroyer lost steering control and started to veer across the big carrier's bow and only rapid and radical maneuvering on Hancock's part averted a collision. The Sullivans soon closed Halsey Powell to render emergency assistance. She slowed to a stop 11 minutes later and lowered her motor whaleboat to transfer her medical officer and a pharmacist's mate to Halsey Powell when another kamikaze came out of the skies apparently bent on crashing into The Sullivans. At 1610 the destroyer's radar picked up the "Zeke" on its approach and as soon as the motor whaler was clear of the water The Sullivans leapt ahead with all engines thrusting at flank speed. Bringing right full rudder The Sullivans maneuvered radically while her 20- and 40 millimeter guns sent streams of shells at the "Zeke " which passed 100 feet over the masthead and escaped. Meanwhile Halsey Powell managed to achieve a steady course at five knots; and with The Sullivans she retired toward Ulithi. However their troubles were not yet over. At 1046 on the following day 21 March The Sullivans picked up a plane closing from 15 miles. Visually identified as a twin-engined "Frances " the aircraft was taken under fire at 10 000 yards by The Sullivans' 5-inch battery Halsey Powell joined in too and within a few mo meets the "Frances" crashed into the sea about 3 000 yards abeam of The Sullivans. At 1250 a combat air patrol (CAP) Hellcat from Yorktown under direction by Halsey Powell splashed another "Frances." At 1320 a CAP Hellcat from Intrepid directed by The Sullivans downed a "Nick" or "Dinah." 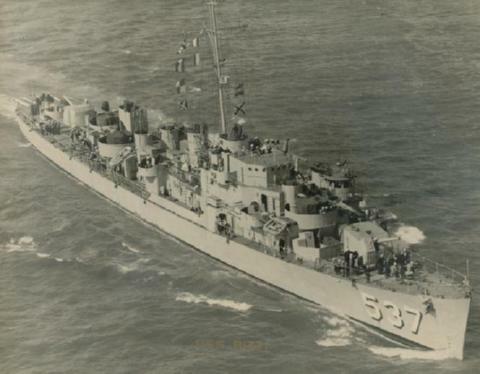 On 25 March The Sullivans and Halsey Powell arrived at Ulithi the former for upkeep prior to training exercises and the latter for battle repairs. The warship next rendezvoused with TF 58 off Okinawa and guarded the carriers supporting the landings on the island. While operating on radar picket duty on the 15th the ship came under enemy air attack but downed one plane and emerged unscathed. She continued conducting radar picket patrols for the task group ranging some 12 to 25 miles out from the main body of the force. On the afternoon of 29 April she commenced fueling from Bunker Hill but a kamikaze alert interrupted the replenishment forcing The Sullivans to break away from the carrier's side. During the ensuing action Hazelwood (DD-531) and Haggard (DD-555) were both struck by Japanese suicide planes but survived. Kamikazes continued to plague the ships of TG 58.3 as they supported the troops fighting ashore on Okinawa. Everything from landing craft to battleships was fair game for those Japanese pilots determined to die for their emperor in a blaze of glory. On the morning of 11 May a kamikaze crashed into Bunker Hill. The Sullivans promptly closed the carrier to render assistance and picked up 166 survivors. After transferring them to ships in TG 50.8 and replenishing her fuel bunkers she helped to screen TG 58.3 during air strikes on Kyushu. In a morning air attack three days later the gallant old warrior Enterprise was hit by a kamikaze. Four enemy planes were shot down in the melee one by The Sullivans in what proved to be her last combat action during World War II. The Sullivans anchored at San Pedro Bay Leyte Gulf on 1 June for recreation and upkeep. She departed Leyte on the 20th bound via Eniwetok and Pearl Harbor for the west coast. The destroyer arrived at Mare Island Calif. on 9 July and two days later commenced her overhaul. She thus missed the final fleet activity which rang down the curtain on the last act of the war. Worn down by a series of blows delivered by American seapower and stunned by the all but unlimited destructive power of two atomic bombs Japan capitulated on 15 August ending the war. Meanwhile since the return of peace greatly reduced the Navy's need for warships The Sullivans was decommissioned at San Diego on 10 January 1946 soon after her overhaul was completed and she was placed in the Pacific Reserve Fleet. The destroyer remained there until May 1951 when she began reactivation work which prepared her for recommissioning on 6 July 1951. The destroyer soon headed south transited the Panama Canal and pressed on northward to her home port Newport R.I. During the winter of 1951 and 1952 the warship conducted training exercises off the east coast and in the Caribbean. Late in the summer of 1952 The Sullivans departed Newport on 6 September bound for Japan. Proceeding via the Panama Canal San Diego Pearl Harbor and Midway she arrived at Sasebo on 10 October but got underway the next day to join Task Force 77 off the eastern shores of Korea. The ship served in the screen of the fast carriers launching repeated air strikes to interdict enemy supply lines and to support United Nations ground forces battling the communists. Remaining on this duty until the 20th The Sullivans steamed to Yokosuka Japan for a brief refit. After a cruise to Buckner Bay Okinawa The Sullivans rejoined TF 77 on 16 November to resume screening activities and plane guard duty. She supported the carriers as they made the northern-most stab at North Korean supply lines approaching within 75 miles of the Soviet base at Vladivostok. MiG-15 fighters approached the task force but combat air patrol Grumman F9F "Panthers" downed two of the attackers and damaged a third in history's first engagement between jet fighters over water. The destroyer arrived back at Sasebo on 5 December. On 14 December she joined United Nations forces blockading the Korean coasts interdicting seaborne traffic and bombarding shore targets both to support United Nations ground troops and to interdict enemy supply operations. Arriving in Area "G" the following day The Sullivans made contact with the enemy on the 16th off SongJin an important rail terminus and supply center. For the next few days she bombarded trains and tunnels and frequently opened fire to destroy railroad rolling stock and depots and to prevent repairs to tracks and buildings. On Christmas Day 1952 as The Sullivans scored direct hits on a railroad bridge she was taken under fire by communist gunners ashore. Fifty rounds from enemy guns failed to touch the ship although near misses showered the warship's decks with shrapnel. Counter-battery fire from the ship destroyed at least one of the troublesome shore batteries. The Sullivans departed Yokosuka on 26 January 1953. On her way home the warship called at Buckner Bay; at Hong Kong; Subic Bay; Singapore; Colombo Ceylon; Bombay India; Bahrain; and Aden before steaming through the Red Sea transiting the Suez Canal and proceeding via Naples to Cannes France. After a brief fueling stop at Gibraltar the warship arrived at Newport on 11 April. The destroyer operated out of her home port well into the summer of 1953 before deploying to the Mediterranean for a tour of duty with the 6th Fleet. She remained on this duty through the end of the year and returned to Newport on 3 February 1954 for operations off the east coast and into the Caribbean through May 1955. She again deployed to European and Mediterranean waters from May to August of that year before returning to Newport late in the summer. Back at Newport in March 1959 The Sullivans joined a hunter/killer group based around Lake Champlain (CV-39). Then after making a midshipman training cruise in which she conducted antisubmarine warfare operations the destroyer sailed for another Mediterranean deployment which lasted until she returned home in the autumn. Operations out of Newport occupied The Sullivans until the spring of 1960 when she headed south for ASROC evaluations off Key West Fla. During this deployment to southern climes the warship helped to rescue five survivors from a crashed Air Force KC-97 Stratotanker which had splashed off Cape Canaveral. Following NATO exercises in September The Sullivans visited Lisbon Portugal prior to a quick trip through the Mediterranean Suez Canal and Red Sea to Karachi West Pakistan. In late October and into November the veteran destroyer participated in Operation "Midlink III " joint operations with Pakistani Iranian and British warships. After returning to the Mediterranean The Sullivans conducted exercises with the French Navy and with the 6th Fleet and reached home in time for Christmas. In January 1961 The Sullivans assisted in the sea trials of Abraham Lincoln (SSBN 602) off Portsmouth N.H. before steaming south and taking part in Operation "Springboard." While in the Caribbean she visited Martinique. Briefly back at Newport early in March The Sullivans soon returned to the West Indies to support marine landing exercises at Vieques Puerto Rico. In April the ship began intensive training in the waters off Florida to prepare to cover a Project Mercury spaceshot. The Sullivans joined Lake Champlain (CVS-39) at Mayport Fla. and took station. On 5 May 1961 Comdr. Alan Shepard's space capsule passed overhead and splashed down near Lake Champlain and was speedily rescued by helicopters from the carrier. The Sullivans then made a midshipmen cruise in June visiting New York and Halifax Nova Scotia. From September 1961 to February 1962 The Sullivans underwent a major overhaul in the Boston Naval Shipyard. She proceeded to Guantanamo Bay soon thereafter to train for duty as a school ship. She subsequently served as a model destroyer in which officer students could see and learn the fundamentals of destroyer operation. In May and again in August The Sullivans made training cruises to the Caribbean for the Destroyer School. In October after Soviet missiles were discovered in Cuba The Sullivans joined American naval forces blockading the island during negotiations with the Soviet Union over the issue. When the Soviet Government withdrew the strategic weapons the destroyer returned to Newport. For the remainder of 1963 and into the first few months of 1964 The Sullivans continued to train officer students. On 1 April 1964 the destroyer was transferred to the naval reserve training force and her homeport was changed to New York City. Departing Newport on 13 April the warship proceeded to New York and took on her selected reserve crew. Her cruises with the reserves embarked were devoted mostly to ASW exercises and took the ship to Canadian ports such as Halifax Nova Scotia St. John New Brunswick and Charlottetown Prince Edward Island in the north to Palm Beach Fla. in the south. On 7 January 1965 The Sullivans was decommissioned at the Philadelphia Naval Shipyard. She remained in reserve into the 1970's. In 1977 she and cruiser Little Rock (CG-4) were processed for donation to the city of Buffalo N.Y. where they now serve as a memorial. The Sullivans received nine battle stars for World War II service and two for Korean service.